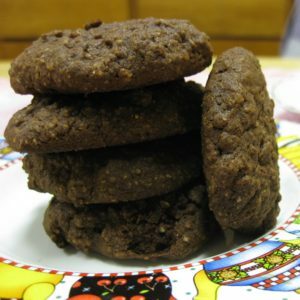 So… I know that it’s a bit strange to post a cookie recipe right after my last posts talking about my sugar addiction struggles. 😀 But, I know that during this time of year when we’re all attending Christmas gatherings galore, it can be difficult staying on track. First, you don’t want to feel like you’re missing out when everyone is eating dessert. I know that the times when I feel like I’m missing out are the times I’m most likely to way overindulge. That bowl of dark chocolate squares will be history in about fourteen minutes. Also, you never know for sure when you attend a party whether there will be any paleo food available, and you worry that it will be just you and the nut bowl again (but not the peanuts. You pick those out.) Solution? Bring your own treats to share! We had a small dessert party at my aunt’s house and I wanted to bring along something. My grandma had clipped out a recipe from Ladies’ Home Journal that I thought looked amazing, so I decided to try to adapt it to make it gluten-free, grain-free, and low-sugar. I also wanted it to be not so obviously gluten-free that everyone else would turn their noses up at it. Tall order! Since my ability to taste sweet has changed so much since I quit sugar, I only need a very small amount of sweetener in order to taste the sweetness. But, I knew that not everybody else’s tastes were the same as mine! So, I ended up making two batches: one with a little more sugar for everyone else and one with a little less. I used to be obsessed with those orange flavored chocolate ‘oranges’ that roll around (heh, because they’re spherical, get it?) around Christmastime. I think that’s why I love these so much: the combination of orange and chocolate together reminds me of that. And when you add the cardamom spice, it’s a flavor match made in heaven! My chef sister pointed out that you taste the orange first, and the taste of the cardamom follows later. I don’t know who had the idea to mix orange and cardamom, but I think he’s a genius. (Cardamon? Cardamom? Who knows.) 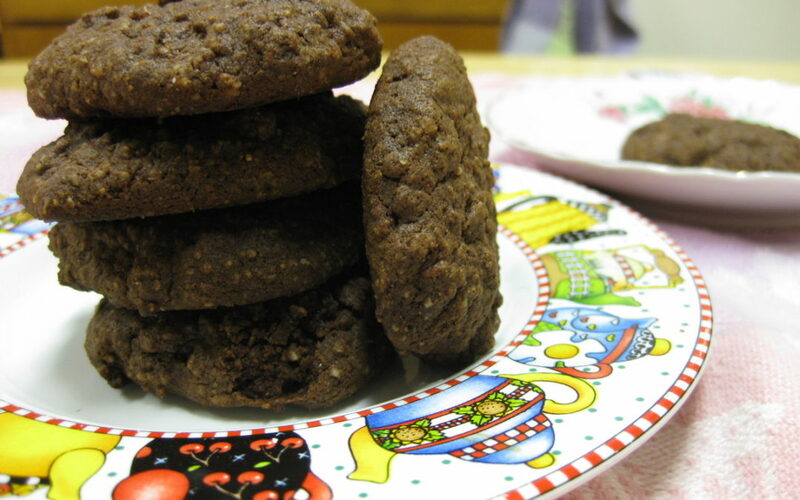 And these cookies are so fragrant — they make the whole house smell aaaaah-mazing. If you’re making these for guests, I would tend towards adding more sugar; if just for yourself, you can adjust the sugar to your own taste. In a bowl, mix the almond flour, cocoa, salt and cardamom. In a separate bowl, beat the butter, molasses and orange zest until smooth. Beat in the egg and vanilla. Add the dry ingredients to the bowl with the wet ingredients and mix, until just incorporated. Drop by the tablespoonful onto parchment paper and bake for 8-9 minutes. Eat before you go! If you’re not sure what will be served, have a snack at home in the form of protein and/or fat. It will help keep you feeling full and you won’t feel as tempted to gorge yourself on more treat-y things. The Three Bite Rule: This one doesn’t work for me, but it does for some people. If you really want something, have three bites and then stop! Another variation of this is to eat as long as you’re enjoying it as much as the first bite. Stop when it’s no longer as good as the first bite.